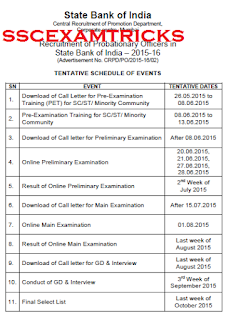 State Bank of India (SBI PO) has released written examination Calender of upcoming exam for the posts of Probationary Officers (PO). The Preliminary Examination is going to be held on 20th June 2015, 21st June 2015, 27th June 2015, 28th June 2015 and Main Examination is going to be held on 01st August 2015 at various centres in all over the country. These SBI PO Exams are scheduled / called letters / Result / Interview Schedule has released on official website which is going to be held tentatively on various dates in months of January to December 2015 on stipulated time. 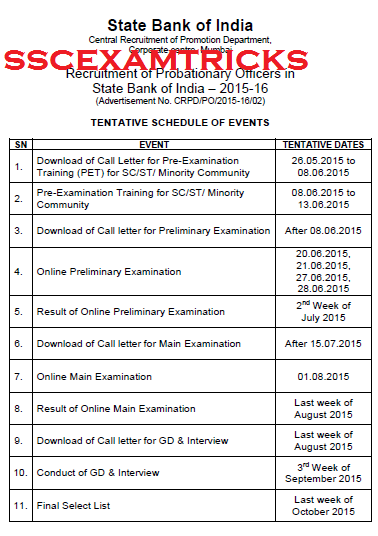 The latest News is that SBI PO exam Calender 2015 has released notice on 14th May 2015 on official website about the tentative schedule of release of pre-examination training call letter, written examination call letter dates, Result date, GD & Interview Dates etc. which can be downloaded from direct link is mentioned in the end of the post. • Go to Direct Link provided at the end. • Choose appropriate Admit Card link for downloading Admit Card. • Enter Registration number and Date of birth or Password. • Click on submit button. • Save or Print the Admit Card.